Vecchia Scuderia means Old Stable in Italian. And this is precisely what the building was before the Lauster family transformed it into a beautiful luxury apartment. It borders the estate of the 'Casa degli amici' (see property No. 20227) on the upper side above the gardens and closes off the compound against the village plaza. The bordering garden offers our guests a quiet place amongst palms, rhododendrons, camellias and fig trees, a place for a quiet read or a siesta. The village of Biganzolo is located on the west bank of Lago Maggiore, about 18 miles from Ascona in Switzerland heading south, or about 40 miles drive from Milano Malpensa Airport, going north. Biganzolo is one of the many small romantic villages nestled on the hill sides along the lake. These villages are known for their art crafts and cooking. The environment: Lago Maggiore although known to be a tourist attraction, remains rather unspoilt by mass tourism or for instance the Toscana. The Alps to the north and the mountainous surroundings of this area offer a wonderful opportunity for outdoor activities. Val Grande National Park, to mention one of many hiking opportunities (located only minutes by car from Biganzolo) is an undiscovered around multifaceted paradise for hikers. The area is also becoming known for mountain biking. Hiking offers trails to roaring waterfalls in wild canyons, mountain streams, beech and chestnut forests and little stone villages, mostly abandoned, built centuries ago from stones quarried from the mountain sides. At the end of trails you might find an eight hundred year old church or monastery or a quaint little village in which to have ice cream and a cool drink of water. Views from the mountain tops are breathtaking and always worth the effort. The large apartment (100 sq m) is comfortable with cosy atmosphere. It has central heating which may be required in the winter months. From its patio there is a view to the lake and it overlooks the large garden which is also accessible to the Vecchia Scuderia guests. The first floor offers a conference room, with separate bathroom, in which seminars, exhibits or small social gatherings can be arranged. It is available for additional rent. This room has its own entrance from the village plaza, where you can park your car and offers easy accessibility to the restaurant and bar across the street. Access to the flat is from the village plaza (Piazza Morrone No. 7) which is where other cars can be parked. 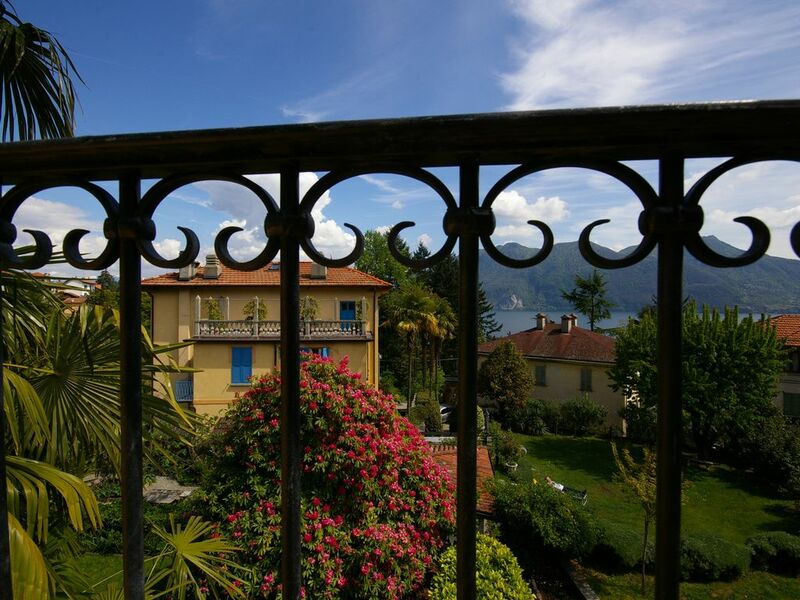 Biganzolo, part of the joint municipality of Intra-Verbania lies partly hidden behind tall trees (including palms, no less) about 300 m above the shore of the lake and well away from the main road along the lake. La Vecchia Scuderia sits in the middle of the old village between gardens and the main square. Shopping is done in Intra - a lovely and romantic 20 minute walk - or 5 minute car ride away in a modern supermarket, or Saturdays in the farmer's market, which sells everything from salami to baby diapers (much fun!). Intra also offers boutiques, restaurants and lake side cafes, as well as a wonderful lake side promenade which leads to the ferry station and more cafes. In Biganzolo, directly across the street lies a restaurant which offers excellent regional cooking. The public beach at the lake is about7 walking minutes down hill and joins a yachting club with bar. Golf: The three golf courses in the vicinity are partially open in winter: Golf Club Alpino di Stresa, 9 holes, 5.397 m, open March – December, Circolo Golf Piandisole, 9 holes, 5.023 m, open April – November, Golf & Sporting Club Verbania near Fondotoce, 9 holes,2.435 m (18 holes in preparation) open all time.